Thursday was the last day of admissions under DU’s first cutoff list. 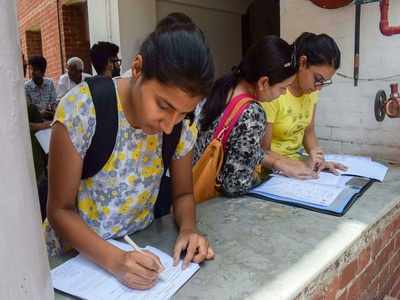 However, some students and their parents were still confused not only about the procedure but also about eligibility criteria or even calculating the best of four. The situation got worse with different “versions” coming from different sources — volunteers, fellow applicants and current students. Volunteers at the helpdesk, too, were stumped by queries meant to be resolved during Open Days. “Students with aggregates lower than the cutoffs are asking for admissions,” said Salvi Nagpal and Yashika Aneja, volunteers at Miranda House. Understanding deduction calculation, which varies from college to college and course to course, seemed to be the most daunting task. Shivangi Mayaramk, who wanted to pursue philosophy (H) in Miranda House, did not make it due to certain deductions in the best of four. “I was not aware that the deduction of marks will be as high as 2.5% even for a humanities student,” she said. Neerja Modi, an applicant from Rajasthan, said she scored 96.25% in Class XII, 0.75% less than the cutoff for political science at Miranda. “My school seniors, not in DU, told me I will get admission. But that’s not happening. So, I have decided to apply for geography at Kamla Nehru College,” she said.